It’s finally here! That summer weather! While we’ve been dreaming of this all winter long (and most of spring), some days you need to escape the heat. Luckily, our county is chock full of places to dip, dive, and splash. Swim clubs are great. They offer lots of amenities other than pools, like volleyball courts and snack bars. They also often times will host events during the summer that you can attend, like an ice cream social! The downside, of course, is the cost. Many find it worth every penny! Price: Memberships range from $400 to $550 plus purchase of a one-time $500 bond. Price: Family memberships $475, individual memberships $265. New members pay one-time membership bond of $700. Priority given to Mount Washington residents. Price: Family memberships $810, dual memberships $715 and individual memberships $615. New members pay a one-time $500 bond. Price: Memberships range from $320 to $875. Still looking for a pool to hang out by but not looking to pay a big membership fee? These public parks have pools to keep you cool! If you grow sick of pools but still want to cool off, there are several fountains and splash pads you can visit. While a lot of these are free, some ask for a small admission fee. The splash pad, located inside North Harford Park, includes a three-ring sprayer and a whale’s tail single spout. The splash playground includes a 280-jet water maze, a cave with a waterfall, spraying animals, water-bucket drops and a slide. You are going to want to run right through the streams of shooting water at this interactive fountain. Sometimes you want to relax in nature’s pools. Here are some of the best lakes and quarries that you can wade in to cool off this summer. While the Beaver Dam Swimming Club is home to one of the most popular swimming holes in our state. The flooded marble quarry averages 40 feet deep, is surrounded by rocks, trees, and grass. You can also find a rope swing! Price: $15 for ages 12 and older on weekdays, $16 on Saturdays and $17 on Sundays and holidays. Always $12 for children age 11 and under. Cascade Lake isn’t in Baltimore County but in nearby Carroll County. This 6-acre lake includes a roped-off swimming area, a 150-foot waterslide and platforms. There’s also a spray-and-play area for those who want a break from the lake. Lake swimmers must be between 8 and 21 years old and must pass a swim test to go beyond the 5-foot depth markers. Price: $15 for adults and children over age 7 and $12 for children ages 1 to 7 on weekends and holidays. On weekdays before 2 p.m., admission costs $10 and $8, respectively. Infants are free. Let’s be honest. Nothing says summer more than a water park! We are lucky enough to have two options in driving distance from Charm City! 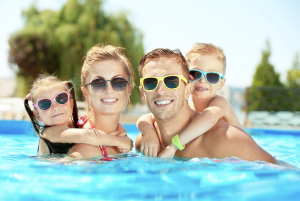 At Chesapeake Beach Water Park, you will find eight water slides, fountains, a lazy river and a kids’ activity pool. Throughout the summer, the park also hosts “night slide” events on Fridays and “character days,” when figures such as Anna and Elsa of “Frozen” or Cookie Monster and Elmo of “Sesame Street” stop by for a visit. Price: General admission is $21. Guests under 48 inches tall are $19. Children age 2 and under are free. Discounted tickets are available for Calvert County and Chesapeake Beach residents, seniors and military members. Six Flags America’s Upper Marlboro water park has water adventures for all ages. Life vests are available for visitors under 48 inches tall or those who are not confident swimmers. Price: General admission $59.99. Guests under 48 inches are $39.99. Children ages 2 and under are free.